H. E. Prof. Dr. Mohammed Salman, Director of Innovation and Enterprise, Kuwait Foundation for the Advancement of Sciences (KFAS), Kuwait. Dr. Cathy Garner, Director of Work Foundation, UK. Prof. Daniele Archibugi, Research Director, Italian National Research Council, Italy. Dr. Sami Marroum, Founding Director of Innovation and Policy Initiative, INSEAD, France. 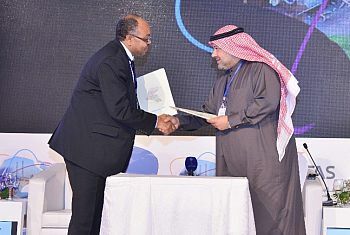 During the conference, Prof. Ahmed signed a memorandum of understanding (MOU) on behalf of WASD and MEKEI (WASD’s sister organisation), agreeing to collaborate and engage in various activities with the Kuwait Government Supreme Council for Planning and Development in relation to Kuwait’s National Project for Knowledge Economy (NPKE).